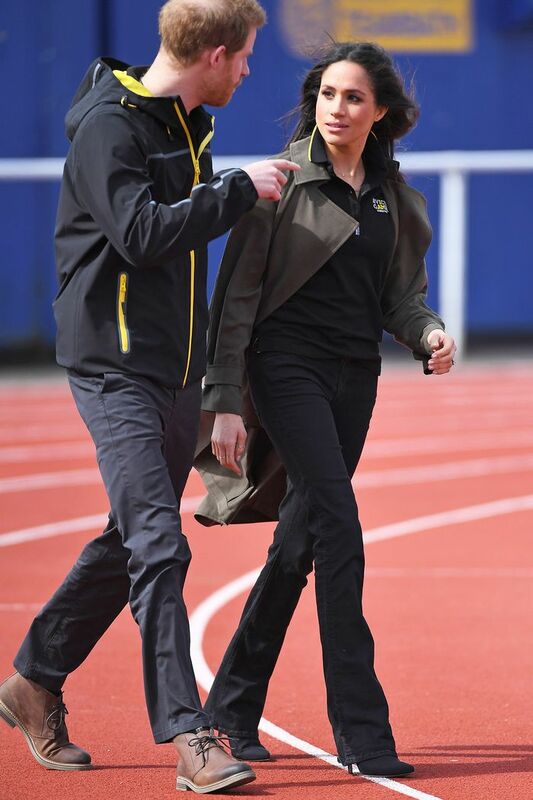 Meghan Markle is quickly becoming known for her affinity for trousers, pencil skirts, and sheath dresses, but some occasions call for something a bit more casual, such as the Invictus Games tryouts in Bath, England, which Markle attended today with Prince Harry. While she's been photographed wearing skinny jeans on repeat occasions (specifically this Mother Denim pair), she went with a different, more unexpected style: flares. Cropped flares have become a fashion-girl-denim staple, but it's certainly been a minute since long flares captured everyone's attention, but that could certainly change, thanks to Markle's approval of the style. Markle's flares, also by Mother Denim, certainly have a leg-lengthening effect, especially when paired with sleek stiletto-heeled sock boots of the same color. She paired them with a polo and a trench from Aritzia (another one of our favorite brands). Mother unfortunately no longer makes the Runaway style, but shop other black flares below.